My Guide for Cycle Tourists! The cliche goes: When In Rome, Do As The Romans Do. The same goes for this place. Eden Burrow is a roamin’ artist’s dreamtown. I never attended Burning Man– where everyone attending is expected to at least pretend to be an artist–but the minute I stepped out of Waverly Station in Sept 07, I was smitten with this stunning multi-layered town. Do art buyers gather here, too? Or do the artists just buy each other’s art? Perhaps this will eventually be Edinburgh’s destiny: a world heritage Art Cauldron. Within two blocks I felt like I had new eyes…Even in ordinary conditions, my mind is re-booted daily ….every 24 hours a new, different–not necessarily tidy– desktop! Paired with a twelve nanosecond attention span, and you get…er, the Mind of the Wombat. So here I am, looking all around me at the Cool Things…and making mental notes for the kind of book you can do in installments of twelve nanoseconds (or less). My ‘research’ was done by roaming on racer/organizer/roommate Helen Findlay’s spare “Dreichcycle”. 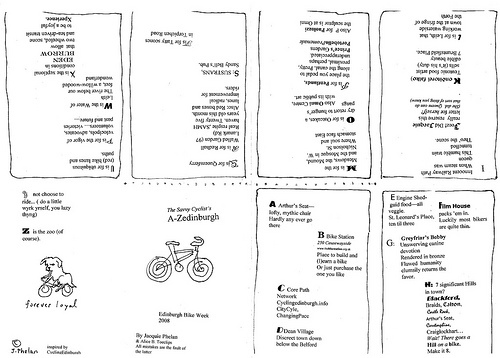 I call it The savvy cyclist’s A-Zedinburgh –a freebie to give the people who came to this years EBFF (Edinburgh Bicycle Film Festival). Fold a letter-sized sheet of paper in half three times, snip a strategic slot in it and fold cleverly. Here’s the video (thanks, Chris). and you will get your copy of this amazingly useful mini-book. “Bike-o-graphed” if you so desire. Our staff are standing by to take your order. My quick trip to meet book agent Jenny Brown was most pleasant. I think she gave my work (three books produced in the last three months) the highest compliment: “These are wacky!!”. Yes. I did it. I made a commercial pitch to an extremely gifted (and busy) agent. A helpful agent at that , who gave me five minutes, more than the three I had asked for. All artists benefit from help. Even us poseurs.